I went in to a big box retailer and the sales person guided me away from a plasma TV and suggested I look at either a LCD or DLP TV due to the longevity of the screen. Do you have any factual data about the length of time a plasma TV will last? I look forward to hearing from you. Thanks - Pieter - Austin TX. Can you please advise me if I have to recharge the pixels after I purchase a plasma TV. If I need to do where would I take my plasma TV to get it recharged? Thank you in advance. Bill Price, Washington DC. What is the average life of the Plasma TV? In other words how many hours of use do I get out of the TV. Does an LCD screen last longer? Is there any way to remove various degrees of "burn-in"? I have read (from your FAQ) that playing a gray static image can "erase" burn in. How is this done? What shade of gray do I need to use? Thanks. I am seriously considering purchasing a plasma tv but am worried about the issue of screen burn in. This appears to be more of a problem now to me as more and more broadcasters air their programmes with their company logo in the corner of the screen. Will this leave a 'ghost' image affecting the plasma screen? Another issue could be whilst watching sporting events (eg soccer) where the scores are displayed in a fixed location throughout the transmission. Would this have the same affect if the score remains unchanged? Will mounting a plasma tv on a vehicle affect its longevity because of burnouts or other factors? Once the plasma tv hits the 50% brightness level, is it still watchable, and can you adjust the contrast and brightness controls to offset this. If so, how do these adjustments affect longevity. What is better/worse for a plasma display -- turning it on and off frequently, or just leaving it (with a changing background, like a screen saver or tv signal)? RE: burn-in correction. I've read that burn-in can be corrected by displaying a grey image on the entire screen for a period of time. Does this really work or is the burn-in permanent? How long would the grey screen need to be displayed? Misconception #1: Many retailers seem to be telling consumers that plasma monitors will only last a couple of years which is false as you will see below. Misconception #2: The gas plasma inside the plasma TV can be refilled or replaced when it burns out. This is false. So how long will a plasma last? The long and short of it is that it depends upon your daily hourly usage as well as how you use the monitor. 12 to 17 years is my short answer. One practical example I will cite here is the Panasonic Tau units being used by In Motion Pictures at major airports around the country. These plasma monitors have been in use now for 3 -1/2 years. In Motion Pictures displays images on them from 6AM until 10PM daily (16 hours). These plasma TVs still look great. They never fail to catch my eye as I pass by in one airport or another. If they have lost some of their brightness level I can hardly tell. The naked eye test is always best. These plasma displays have been used already for almost 20,000 hours and have plenty of life left. Already this use equates to 18 years for an owner that watches 3 hours of video or computer content per day. Panasonic: States (not publicly) that the monitor is good for 20,000 to 30,000 hours. They also state that these plasma displays measure 50% brightness (phosphor ignition may be a better term) at 50,000 hours. Pioneer: States that the 50" PDP 502MX (or 505HD) measures half brightness (phosphor ignition) at 30,000 hours of use. They also state the newer model 503CMX (or Pro 1000HD) with a deeper pixel structure will last even longer though they do not have numbers. Sharp: States that plasma panels only last 10,000 to 20,000 hours and that LCD monitors last longer. Figures they would say that. For consumer use these numbers should be comforting. Plasma Displays are now about equivalent in longevity to CRTs, which typically state 25,000 hours or so life. Let's put these hours in perspective. The average U.S. household watches 4 to 6 hours of television per day. Staggering. Taking a mean time manufacturer stated longevity of 22,500 hours of usage, times our average 5 hours per day we come up with over 12 years of usage. And that is on the low side of estimates. At 4 hours per day and 25,000 hours we are looking at 17 years. Now, there are varying degrees of phosphor ignition along the way (the same way a CRT fades). Dissipation begins the moment you turn the set on. After 1000 hours of usage a plasma monitor should measure around 94% brightness, which is barely noticeable to the naked eye. At 15,000 to 20,000 hours the monitor should measure around 68% brightness or to say it differently, 68% of the phosphors are being ignited. There are steps you can take to ensure longer and better life from your plasma display panel. 1) Never leave static images on the unit. Do not pause a picture on the plasma for more than a minute. This will cause phosphor burn in. Watch the unit in full widescreen format as much as possible to avoid differentiation between the side bands of the unit. While this does not actually decrease the longevity of the phosphors it does cause an annoyance to have to play a gray static image to "erase" the burn in. 2) Use Brightness and Contrast levels that are necessary for viewing - not excessive. In a brightly lit room you may need to use more contrast and brightness, which will decrease the life of the unit. However, there are memory setting adjustments available on most recent plasma monitors that allow the user to choose a memory setting to suit viewing needs. At night, or in a lower light room use lower contrast and brightness levels and extend the life. 3)	Keep the monitor/TV in a well-ventilated area. The unit will not have to work as hard to cool itself. 4)	Turn the unit off when not in use. 5)	Keep the unit out of reach of small children. How do the manufacturers know how to calculate the figures since plasma monitors have not been out long? The manufacturer facilities in Japan test plasma panels at 100% white image light and measure down from that point with meter readings. It takes hours to find that 50% mark - between 30,000 and 50,000 hours. What a job that would be… - to watch the white light. We get a lot of inquiries about this topic so I thought it easier just to write a short article about the subject to put it to rest. For some reason at retail stores in different parts of the world salespeople often tell consumers that they should not purchase a plasma display because the pixel cells have to be periodically recharged. Who knows where they get this information. It is completely false. 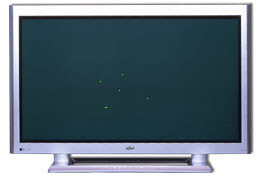 The above is an example of a Fujistu plasma TV with a cluster of green cells. There is no recharging process. There is no gas that needs to be pumped back into the display. There is no way to “re-gas” a plasma monitor anyway, since the plasma display element is a fixed pixel device with each pixel etched into the glass substrate. So called “ribs” within the glass substrate envelope further separate this cell. Further to discourage any potential “re-gasser” are black striping and more ribbing separating each of the three phosphor colors of red, green, blue. Finally, there is a rear glass substrate protective layer behind all of this technology. Each pixel cell in a plasma display has its own transmitter or electronic power supply. In the case of a 1024X1024 plasma display that is 1,048,576 individual pixel cells with 1,048,576 electric pulse transmitter wires connecting video boards and processors to the rear panel of the rear glass substrate. In sum, there is no practical (nor probably impractical) repair. Not sure if I have made the point yet but let me state it plainly. If a pixel cell expires, it is out, and there is nothing you can do about it. It is just one of 1,048,576 and is likely not to disturb your viewing pleasure. It will just appear as one black spec on the otherwise vibrant, colorful screen, and thus, not noticeable. The cell may first appear in green only. When a cell appears in green it is noticeable. This means that the electric pulse is not exciting the red and blue phosphors in that particular cell. You may find this annoying but at least you can rest assured that the green phosphor in that one cell will expire years before your plasma display. Thankfully, pixel outage has not been a problem for recent models of plasma TVs. Manufacturers test the product very thoroughly for these defects before shipping to the U.S. or anywhere for that matter. I have seen it in some of the NEC product more frequently than other manufacturers but the problem seems to be under control. Still, manufacturers do not publish exact policies regarding pixel cell outage. They follow some practical gray guidelines suggesting that if there are four or more pixels out on one plasma display then that it is a replacement case. Less than that, and the unit will probably not be replaced unless the dealer you purchased the unit from is willing to go the extra mile to take care of you. The Plasma TVs will reach their half brightness level after 12-17 years with average viewing of 4 - 6 hours/day. That is same for standard CRTs. LCDs have a similar life expectancy. This usually will come as a feature on most plasmas. Some will also include a negative image that can be displayed in order to remove the burn-in. There is no specific shade of gray that needs to be used. Some ghosting may occur if you are watching a channel for several hours and the same static image remains on the screen for a prolonged period of time, such as the score or a ticker or network id. There will likely be commercials to help break up this static image. Normal viewing will dissapate the ghosting and it will go away. Burn-in is a problem that would not go away with normal viewing. For burn-in to occur, it takes a much longer period of time. Ghosting and burn-in are problems that are alleviated with pixel rotating or wobblers, in which the image is moving slowing across the screen and is imperceptable to your eye. Mounting a plasma on a vehicle in motion could have adverse affects on the longevity of the plasma with the vibrations from the road. The plasma will still be watchable at the reduced brightness level. I would suggest calibrating the plasma using either the AVIA or Video Essentials calibration DVDs. When set up correctly, the plasma will render a much sharper picture and last longer. This is difficult based on what one would deem frequently. Off and on every few minutes would not be suggested. Turning it off and on about every hour is not something to worry about impacting the lifespan. I would definitely recommend using a screen saver if the image on the screen is static when it is not going to be utilized. There is no predetermined duration for an image to burn-in. There should be an orbital mode on that unit, I would suggest activating it to prevent burn-in. True burn in cannot be fixed. There is also another effect referred to as ghosting, this is temporary and can be fixed with the negative image and through normal viewing.